Between 1962 and 1979 the NSF [National Science Foundation] Polar Research Vessel Eltanin surveyed Antarctic waters, studying the ocean and ocean bottom. In 1964, the ship photographed an unusual object at a depth of 13,500 feet [4,115m]. At the time, there was no submarine that could have carried a piece of technology to this depth. There exists the possibility that it is an antenna or other scientific instrument that was lost by an early research vessel, but once again, this would appear to be a very forced explanation. It seems unlikely that an object could drop through [over] three miles of ocean, and anchor itself on the bottom. So – how much of this strange tale is accurate? What has led anyone to consider the position of the so-called ‘Eltanin antenna’ to be “so exact, and so strangely significant”, let alone to suggest that the ‘antenna’ might be a chunk of ancient or extra-terrestrial technology? Is it remotely possible to identify this admittedly intriguing-looking object? Let us plumb the depths of history – and of the human mind. For those well-versed in such factitious riddles as the Bermuda Triangle, it may come as a disappointment to learn that the USNS Eltanin did indeed exist, and did take a photograph of a somewhat mystifying object in 1964. Displacing 1,850 tons [1,880 metric tonnes], 266ft [81m] long, and with a top speed of 13 knots [24km/h], the Eltanin was launched on 16 January 1957 at Avondale, Louisiana, and saw service with the US Navy as an ice-breaking cargo ship. In August 1962 she was reclassified as an Oceanographic Research Ship and became the world’s first dedicated Antarctic research vessel. 2 From then until 1975, her complement of scientists measured temperature, salinity, and depth of the region’s waters, took core samples and, using a camera and strobe light on a cable, photographed the ocean floor. Among other things, analysis of the Eltanin’s core samples led to the realisation that a 1-4km [0.6-2.5mile]-wide asteroid – now known as the Eltanin asteroid – had hit the ocean floor some 2.15 million years ago with the force of 100 billion tons [101.6 billion metric tonnes] of TNT. The American research ship Eltanin sailed into Auckland yesterday with a mysterious photo taken at 2,250 fathoms [13,500ft/4115m] 1,000 miles [1,600km] west of Cape Horn. The photograph, which to a layman shows something like a complex radio ærial jutting out of the mud bottom, was taken on August 29 by a submarine camera. The camera is housed in a metal cylinder pulled along by a cable from the ship. It bounces along the sea bed taking pictures at regular intervals. Dr Thomas Hopkins, senior marine biologist on board, who specialises in plankton studies, says the object could hardly be a plant. “At that depth there is no light so photosynthesis could not take place and plants could not live. Dr Hopkins, a graduate of the University of Southern California, said the ship’s photographer had been thoroughly questioned on how he had developed the photograph. However, everyone was certain the picture was not faked. “I wouldn’t like to say the thing is man-made because this brings up the problem of how one would get it there,” he says. It has been estimated the object is about two feet [60cm] high. The photograph is to be sent to several United States research foundations for analysis, and Dr Hopkins will take prints back to the University of Southern California. The Eltanin, owned by the [US] Military Sea Transportation Service, is being used in part of the United States National Science Foundation Antarctic research programme. 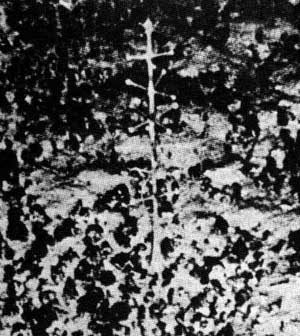 In a 1968 article in Saga magazine,4 peddler of popular mysteries Brad Steiger planted the curious submarine object firmly in the fertile soil of fringe knowledge, with the somewhat tenuous claim that the Eltanin’s camera “photographed an astonishing piece of machinery… very much like the cross between a TV antenna and a telemetry antenna. The device, whatever it was, looked as out of place on the ocean floor as a giant squid would look nestled among the computers at IBM.” He went on to speculate that this ‘mechanical apparatus’ was designed to monitor seismic activity. Speculation, in such cases, is tantamount to knowledge, and so with incisive insight Steiger concluded: “One cannot help becoming a bit uneasy knowing that someone – whether they be space visitors or representatives from some undeclared terrestrial organization – knows quite a bit more about the measurements and crucial rumblings of our planet than our top scientists do.” Aliens or MIB – the specials on the blackboard at the Believers’ Bistro haven’t varied for decades. Of course, plenty of weird things – some living, some not – exist at enormous depths in the ocean. For most people, the Eltanin picture might have faded into the twilight of half-forgotten scientific curiosities, had not a reader of the Herald with some original ideas of his own become intrigued by it – so much so that he actually visited the ship and questioned the scientists. Like the pantomime beanstalk, a vast and labyrinthine mythology has grown from what he made of the Eltanin’s find. In 1952, New Zealand pilot Bruce Cathie had a UFO sighting that “dramatically” changed his life, and inspired a quest to find some order and sense in the phenomenon. Cathie – following the example of French ufologist Aimé Michel 5 – decided to look for patterns in the locations where UFOs were hovering and in their reported flight paths. In an article for Nexus magazine, 6 Cathie explained how, after great labours, he was able to form a complete grid network over the whole of the New Zealand area by gradually plotting onto the map the most reliable UFO sightings. The pattern consisted of lines spaced at 30-minute intervals orientated just on six degrees displacement from true north. Eventually, two similar grids were found to be interlocked with each other, creating rather a complex pattern which could be further reduced to lines with a spacing of seven-and-one-half minutes. Further concluding that “the speed of light, mass and gravity acceleration values must have some connection with the grid structure in order to explain the extraordinary manœuvers carried out by the strange craft”, he finally arrived at his ‘basic’ grid structure, which was formed by a series of great circles interlocking at various points around the Earth’s surface. One of the most startling facts that I discovered by application of grid mathematics was that an atomic bomb is a device based on the geometrics of space and time. To be successfully detonated, the bomb MUST be geometrically constructed, placed on, under, or over a geometric position in relation to the Earth’s surface, and activated at a SPECIFIC TIME in relation to the geometrics of the solar system. I found that it was possible to precalculate the time of various bomb tests, and the locations where it was possible to explode a bomb. … A logical war cannot be considered under these circumstances. This could be the explanation for the proliferation of conventional weapons in modern warfare. Cathie also concluded that the lines of his grid, which he believed UFOs slavishly followed, were magnetic lines of force, although geophysicists have failed to notice anything of the kind on their instruments. His most remarkable claim was to have overcome Einstein’s difficulties in reconciling quantum mechanics and relativity theory – a puzzle that still vexes physicists, if not Mr Cathie. This surreptitious recognition, should it enjoy some actuality, must be a comfort to Mr Cathie when he regards what some others have made of his work. 288 = 144 x 2 or “double light”. 315 = ELTANIN ANTENNA + THE ZERO POINT !!! This is all very remarkable and, no doubt, an original contribution to the sum of human knowledge. It is presumably on work like this, as well as Cathie’s, that Whitley Streiber based his remark that the position of the ‘Eltanin antenna’ is “so exact, and so strangely significant”. Fascinating as all this is, the unanswered question remains: what is the ‘Eltanin antenna’? Does anyone know? Now, here’s a teaser: it’s been identified since 1888 at least – a little earlier than its seeming ‘discovery’ in 1964. After years of benign neglect outside the circles, spheres and grids of numerology, the Eltanin object resurfaced, so to speak, in the 8 October 2003 edition of the e-zine UFO Roundup, edited by Joseph Trainor – who likes to add a blast from the ufological past at the end of each issue. That led to a brief discussion on Errol Bruce-Knapp’s ‘UFO UpDates’ list, and to another on Jan Aldrich’s ‘Project 1947’ list, following questions raised by indefatigable ufological cataloguer and cartographer Larry Hatch. ‘Project 1947’ member Tom DeMary, a researcher in underwater acoustics in his day job, contacted oceanographer AF Amos, who had been on the USNS Eltanin in the Antarctic in the 1960s (although not on the cruise in question), and asked him for clarification. Armed with this information, Larry Hatch tidied up a few loose ends and published the results on his website (www.larryhatch.net/ELTANIN.html). 2 The officially-recorded depth, cited in Heezen ‘ Hollister [see below], at which the ‘Eltanin antenna’ was photographed is 3,904 metres (12,808ft, or 2,135 fathoms). 3 Thanks to Murray Bott and Peter Hassall for making this clipping from the files of Henk Hinfelaar available. 4 Brad Steiger ‘ Joan Whritenour, “Unidentied Underwater Saucers”, Saga, June 1968: see pp 36–37. 5 See Aimé Michel, Flying Saucers and the Straight Line Mystery. Criterion Books (New York) 1958; originally published as Mystérieux Objets Célestes, Arthaud (Paris) 1958. 8 See “The Mystery of the Eltanin Antenna and the Alphanumeric ‘144’ Connection” at hometown.aol.com/codeufo. 9 Here is an example of Munck’s work, as advertised on his website www.pyramidmatrix.com The Code 2000 – Carl Munck: Carl tries to “avoid the math” as he clearly demonstrates the simple, yet beautiful elegance with which ancient monuments and pyramids were placed in the global matrix to let anyone know why there are where they are [sic]. Learn how the “Temple of the Giant Jaguar” at Tikal points to sunken Lemurian ruins off the coast of Okinawa that were recently discovered by a scuba team. (Munck does this by using the sunken pyramids at Rock Lake as a clue.) Now, learn how these Lemurian ruins connect themselves to Tiahuanaco and the pyramids of China’s Xian Province; again, without using Code Math (well, OK maybe a little, but it’s fifth grade stuff to figure this one out). Learn the relationship between Olympus Mons, Jupiter’s Great Red Spot and the former position of the Great Pyramid and how they relate to hyperdimensional physics and anti-gravity. Much more is covered in Carl’s most authoritative look yet at the global matrix. 12 Heezen ‘ Hollister, op. cit., pp 35–7.